Two Tip Tuesday! All About Color! I thought it would be fun to designate one day a week to share my crafting tips. I will always share at least two tips, so I will call it Two Tip Tuesdays! My first Two Tip Tuesday topic is color. When I teach classes, I always get a lot of questions about color, how do I know what colors go well together, what about mixing patterns, do I have to use a color from my photograph, you get the picture! I am very lucky that I was born with a good sense of color, but for those who do not feel comfortable with color, I am going to share a few easy ways to help you learn about combining colors and to help you get a feel for your own personal color style. My first tip is to look around your home and in your closet, here you will find the colors that speak to you personally. My home and closets are filled with what I call tropical earth tones, tans, greens, blues, and corals. Not surprisingly, these colors often show up in my crafting because they are colors I am comfortable with and love to work with. They are even the colors in the blog header I chose! So, take a closer look at your home decor and wardrobe with an eye towards defining your own personal color style. You will likely find these colors popping up over and over again in your cards, scrapbooks and other crafting projects! My next tip will help you become more comfortable with combining colors. Let a professional do the work for you! The people who design fabric and papers do this for a living, they know what works and what doesn’t. Select a pattern that speaks to you and choose 2 to 3 colors from the pattern for your color palette. And don’t forget the 60-30-10 rule, your dominant color should make up 60% of your project the complementary color 30% and the accent color 10%. Following this rule will make your project more visually appealing, no matter what colors you choose. My last tip for today is a website that can help with choosing a color palette and teach you about color theory. 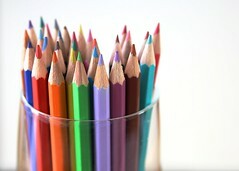 ColorSchemeDesigner.com is a fabulous website for choosing color combinations. It is interactive and shows you the complement, triad, tetrad, analogic and analogic with accent of any color you choose. Not only is this a wonderful resource, it is lots of fun too!